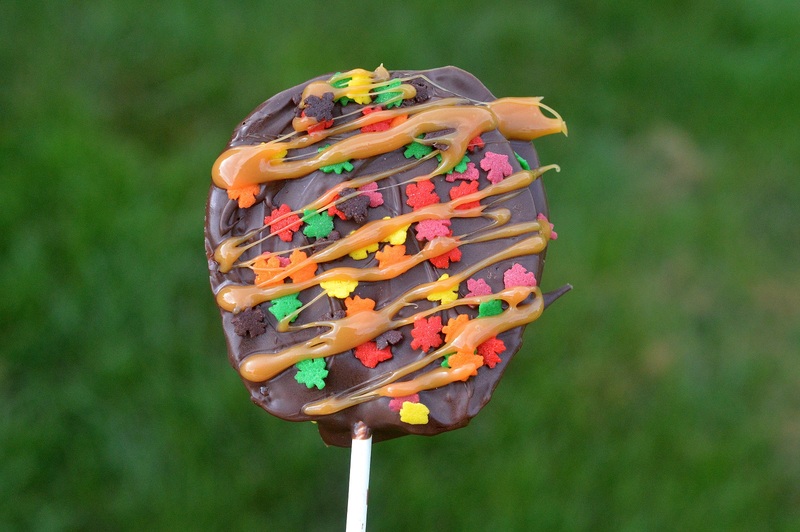 When fall rolls around a favorite treat of many are candy apples. Caramel coated, chocolate covered or dipped in the iconic red candy…The irresistible crunch and juiciness of a candy apple can’t be beat! However they are a lot to eat, so today let’s talk about How to make Candy Apple Slices. 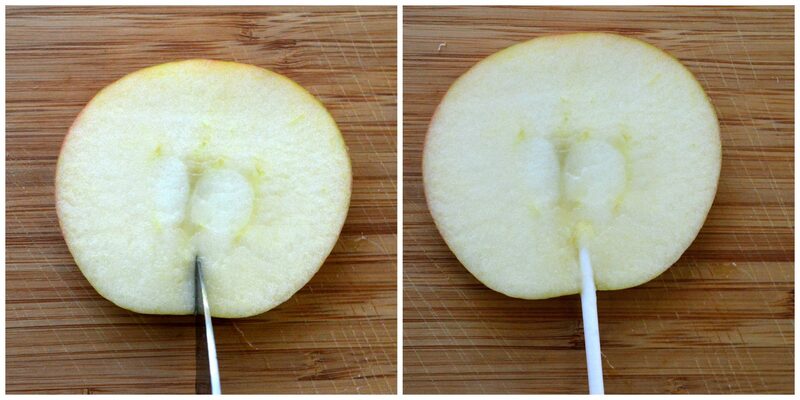 Instead of dipping whole apples, how about simply slicing your favorite apples and tricking them out! This way, you only eat just a slice or two and you can try a variety of flavors. Let me tell you just how happy my kids were when they came home to find these Candy Apple Slices! On top of those that I had made, I left out everything so that the kids could learn how to make candy apple slices themselves. My kids were off from school two days last week, so my daughter (13), and one of her friends decided to do some fall treat-making. They chose to make ghost pretzels, dipped strawberries with eyes (too cute! 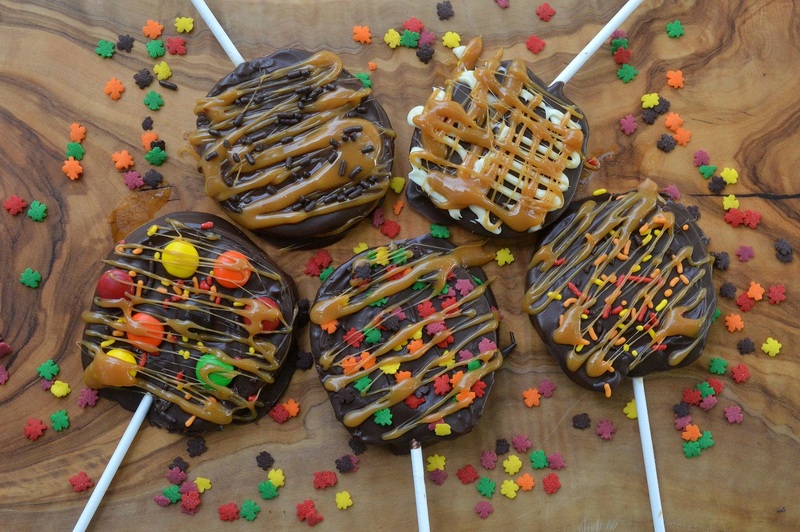 ), Halloween cookies and pumpkin Rice Krispy treats. They ended up making 3 of the 4. One thing they tinkered with making was dipped apples…so because I had a bunch of supplies left over from their fall cooking-fest, I decided to do it for them. When it comes to how to make candy apple slices, there are two tricks. One, slicing your apples just the right thickness (not too thin) and two, making sure the whole apple slice is completely covered in chocolate. If you miss a section of apple, the juices will begin to leak out. Other than those, you can have these done in 15 minutes. The cleanup is the worst part! Getting melted chocolate and caramel out of bowls and off of spoons isn’t fun, lol! Set time aside this fall and grab your kids or grandkids and show them how to make candy apple slices. I will bet you a dollar that they will love both making these and eating these! 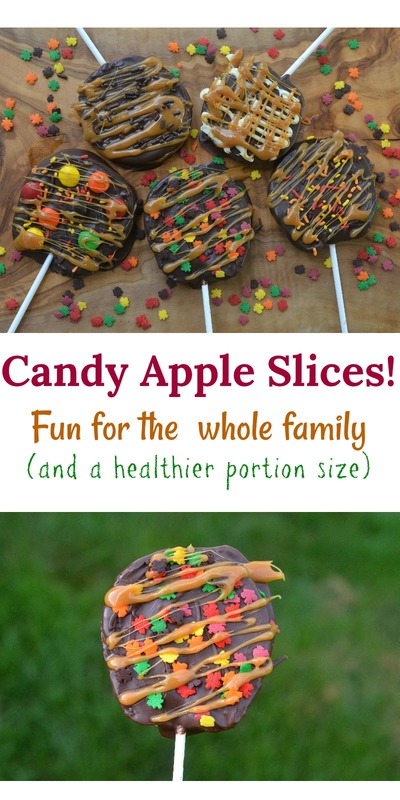 There are no rules as to what you use to make these fun Candy Apple Slices, just have fun! Set up everything you will be using to decorate your Candy Apple Slices. In small individual bowls, place the chocolates and caramels you will be using to cover the apple slices in. Dark chocolate, milk chocolate, white chocolate all work fine. I prefer the melting disks from the craft store for this since they melt evenly and smoothly. Slice apples to about a ⅛ inch thickness. You can have all sizes of slices to not waste the apples OR just eat the smaller ends instead of dipping them, your call. At the bottom of each apple slice, make a small slice3/4 of the way through, gently but firmly press a candy stick into the apple and push it up into the apple a bit. Place the apples on your parchment paper lined baking sheets. Melt the chocolate you will be covering your slices in and with a spoon, spoon the melted chocolate onto one apple slice at a time, making sure you have coated the top and sides and secured the stick with chocolate. Gently flip it over and do the other side. If decorating with sprinkles, jimmies or candies, do so quickly before chocolate begins to harden. Melt additional chocolate for drizzling (white on dark or dark on white) and drizzle onto chocolate-covered slices. Melt caramel and do the same. Caramel will solidify fast, so move quick. A small spoon will work for drizzling the caramel. To melt the chocolates as well as the caramel, place each separately in small bowls and one at a time, microwave in 15-30 second bursts, stirring in between until you can stir the chocolate and it becomes smooth. Caramel will take a little less time. Be careful not to burn. Once all slices are finished being candied and decorated, place your tray(s) in the fridge for 15 minutes to ensure all is heartened. Best if enjoyed within 24 hours. I have used this recipe a few times now I love it. The first time I made them they came out perfect. You really need to know the exact temp of when the sugar hits the hard crack stage. Do you have to dip them in lemon to prevent browning?? Thanks! Easy & fun! Plus…more caramel & chocolate per bite lol!